When you take the plunge to become a freelancer, you are bombarded with a huge list of Do's and Don't's that you must follow. I've now been working for myself for around 18 months and although some of the rules can be super important (keep track of your taxes, keep in touch with clients, learn how to say no etc.) others, for me, never really stuck. 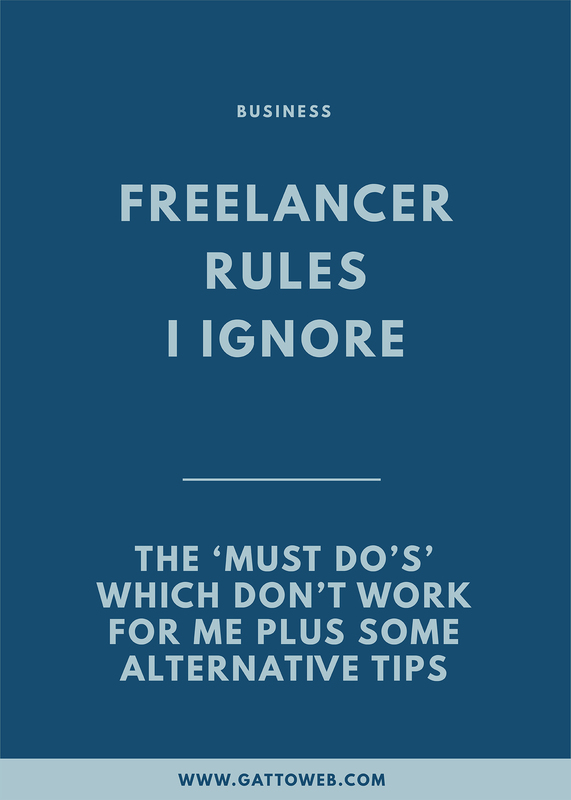 When you become self-employed it's really a case of figuring out what works for you but here are the 'FREELANCERS MUST FOLLOW' rules which I have found don't work for me. The idea of this point is to set your 'working area' separate from your 'living area' and then your house feels less like an office and in theory relaxing becomes easier. I totally get that this would work for some people, however I find I like to work where feels best at the time. Sometimes, I like to sit at a desk and concentrate and other times I kind of want to watch Homes Under The Hammer whilst I answer a few emails (and convincing myself I would be amazing at property development). Personally, I like to keep flexible and luckily I enjoy my work enough to not despair at the thought of my office being in my home. If anything, it's one of the things I love about being self-employed! Alternative Tip: Take a bit of time to get out of the house to avoid feeling stuck in the same space. I make sure I take some time to walk my dog and get some fresh air so I don't get cabin fever! Another rule similar to the one above is to set working hours as if you worked a regular 9-5 and stick to them to ~preserve sanity~. Again this can be important if you struggle to switch off (which believe me I do!) but flexibility is the beauty of freelancing. Yeah, it's nice to have evenings and weekends off but it can also be great to work whenever you want. Giving yourself the freedom to decide when to work means you also have the freedom to have time off. Need a pamper day? Go for it! Want to miss the weekend rush at IKEA? Fire away! And if you need to make that time up in the evening whilst catching up with the latest Netflix original, you have nothing to worry about. Alternative Tip:Instead of having set times, write down your set tasks for the week, how long they will take and then fit them into your week in a way that suits you. Don't get me wrong, it is great to have a business plan and stick to every single world but is this a realistic goal? Probably not. With a flexible job title comes uncertainties and although this is something we'd all like to avoid, it is just part of the job. You may have slow periods and you may have crazy busy periods and the point is, we need to adapt as and when they appear. What I prefer to do is set out rough goals and objectives and work towards those. Once I have reached them, I set myself new goals and I will always have something to work towards but not necessarily feel the pressure of a set plan. Alternative Tip: Think of the bigger picture (one, two, five years down the line) but don't let it pressure you if things aren't going to plan. Try to focus on smaller, short term goals. Starting out, a lot of people will tell you to do all of the work you receive regardless of price to build your portfolio which in all honesty is the advice which I took on board when I started freelancing. In the first 6 months, I took on all of the clients who contacted me which meant I was accepting much less income than I wanted and I was also compromising my creativity. Although it is great to have income in the first few months of freelancing, you also have to keep in mind that the people you work with now will most likely determine the people you work with in the future and if you aren't happy this isn't ideal, especially for creatives. Alternative Tip: Avoid clients who want you to work for next to nothing (or even for free) unless it is work that will really benefit you in the long run but also keep in mind that most reputable organisations do have the funds to pay you an appropriate fee.